A group of amateur musicians -- with varying to no musical training -- has formed more than just a New Horizons Band at Indiana State University's Community School of the Arts. "Looking around the room, these are people who started as strangers. Now, they have a whole roomful of friends. That's the cool thing about something like this that you don't find everywhere," said Norm Hanson, director of New Horizons. 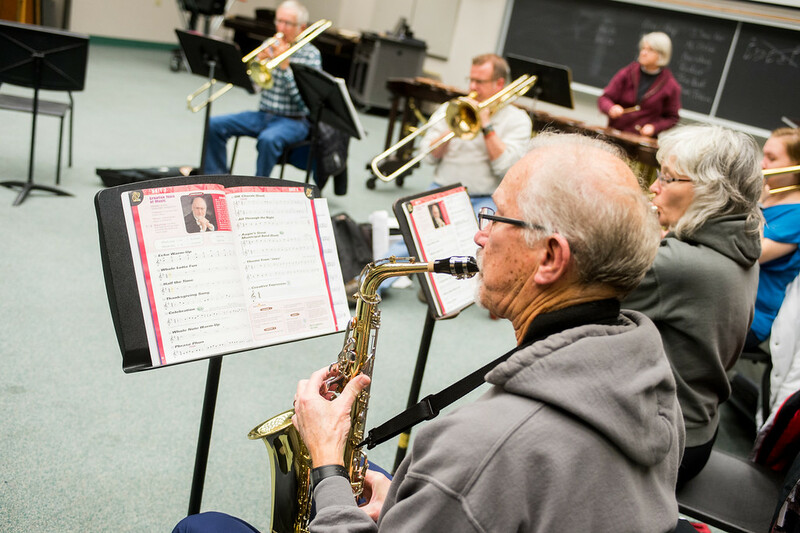 Designed for adults, ages 25 years and up, the New Horizons Band is for people with little or no musical background who want to learn to read music, play an instrument and join others who are taking the same steps. While New Horizons band members may have limited experience playing an instrument, Hanson brings with him nearly 30 years as a high school band director. He also leads the jazz ensemble and string orchestra at Rose-Hulman Institute of Technology and plays in the Terre Haute Symphony and bands around the area. "Really, music is all I've ever been good at -- besides throwing runners out at second base, but clearly I'm not playing in the major leagues," Hanson said. "My dad was a college music professor and professional musician up around Chicago and the Muncie area. It's been a part of my life since forever." Talking to him is a little like listening to a jazz jam session -- verbal one-liners resemble a series of improvised musical chords and meters. The upbeat tempo makes the practice sessions enjoyable. "Norm is fun. He makes it fun and they praise you -- they don't complain if you do it wrong or something. So it's a positive thing," a New Horizons' member said. In addition to new friends and new (or renewed) hobbies, New Horizons offers health benefits. Band members are taught to breathe intentionally and from the diaphragm. Research has shown playing music is the brain's equivalent to a full-body workout and that the brain improves structurally through the rigors of musical training -- no matter your age. "When you're doing something like this, it's the ultimate in multi-tasking," Hanson said. "You gotta keep your place, you gotta remember what button to push, you remember to breathe so you can play. The person next to you is playing something different, so you gotta play your part while he's playing his and not get distracted by that and keep your spot in the music, watching the director, all that." The New Horizons Band is hosting an information day at 10 a.m. Jan. 30 in room 159 at the Landini Center for Performing and Fine Arts on the Indiana State campus. The regularly scheduled New Horizons class will be open for observation, and Hanson will be available to answer questions. The event is free, and refreshments will be served. Instruments will be on-hand to try out. For more information, call the Community School of the Arts' office at 812-237-2528. Please RSVP if you plan on attending the information day. Parking is free on Saturdays on any faculty, staff or student lot. Photo: http://isuphoto.smugmug.com/Other/Media-Services/Media-Arts/New-Horizons-Community-School/i-CBG2mBd/0/XL/11_18_14_new_horizons-5420-XL.jpg -- New Horizons Band members practice at Indiana State University's Community School of the Arts.